Fuel-cell-powered vehicles are still a long ways off. But fuel cell-powered toys? 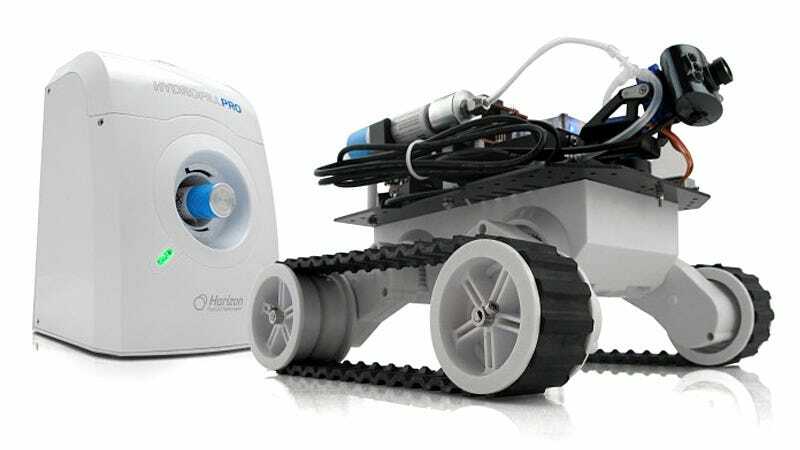 That's an awesome reality that's about to get even better with Horizon Fuel Cell Technologies new H-Rover, which includes a wireless camera streaming live video to your smartphone/remote. The company is best known for its H-Racer RC car which has been on the market for ages now and is in dire need of an update—and that's exactly what the H-Rover delivers. An included charging station powers up a couple of fuel cells with nothing but good old H2O, keeping the rover running for about an hour between charges. And a wireless Bluetooth connection lets you control the rover and monitor its camera from your smartphone of choice. But it's important to remember the money you'll save without the need for an endless supply of Duracells, because the H-Rover will sell for around $800 when it crawls onto the market in the coming months.